Every day, over 1,000 newborns or 10% of babies born in the United States need assistance in breathing at birth*. After a baby is born, there is one "golden minute" for her to start breathing properly or she may suffer brain damage and long-term disabilities or even loss of life. Worldwide, one million babies die each year due to birth asphyxia according to the World Health Organization. The Neonatal Resuscitation Program (NRP) was developed based on the American Academy of Pediatrics and American Heart Association Guidelines for the Cardiopulmonary Resuscitation and Emergency Cardiovascular Care of the Neonate. It is considered the gold standard of care in neonatal resuscitation. At 313 pages, the NRP is long and complex, and even the best clinicians cannot be perfect all of the time. Studies indicate that clinicians have a 16% to 55% error rate in adherence to the Neonatal Resuscitation Program. Based on his experience, Dr. Peter Coelho, founder of MedicalCue, determined that the first application of the Cue platform would be for neonatal resuscitation to provide babies with the best chance at a great life. 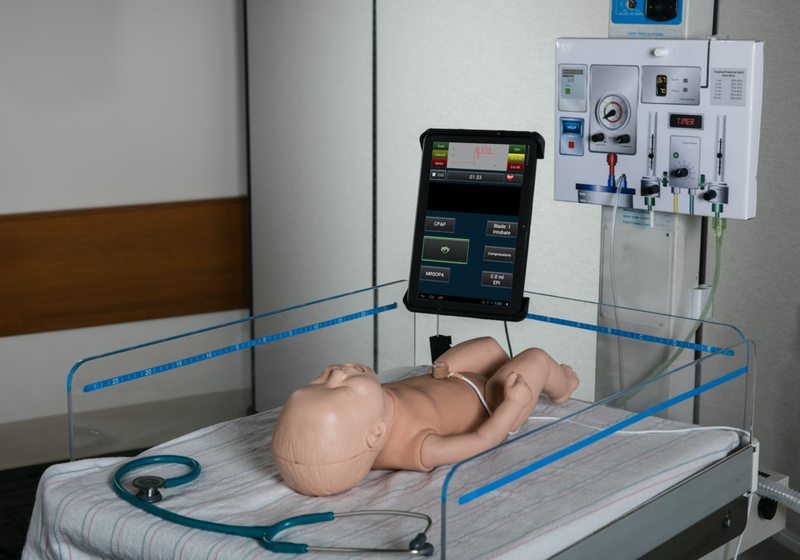 Utilizing the infant vitals and the NRP, the NeoCue presents on the touchscreen panel step-by-step guidance to clinicians to optimize patient care with gold standard protocols. The touchscreen interface was created by former IDEO designers. It also delivers prompts via audio. Think GPS for the NRP. NeoCue acts as a guide or confirmation as clinicians treat patients, reducing stress and saving time. NeoCue also keeps data and records so that clinicians can focus on patient care and not have to spend as much time on administrative tasks. This system will eliminate errors and dramatically improve the outcome of newborns requiring resuscitation. When I think of the delivery room of the future, I think about products such as the NRPAD NeoCue. Thank you! Download the NeoCue Brochure here.